A man who stole a tractor and led six police cars and a helicopter on a super-low-speed chase was sentenced to eight months in prison Monday. Nathan Lovell got exactly what he wanted, since he told the court that he stole the red vehicle in English town of Tilney St Lawrence because he wanted to go to prison. 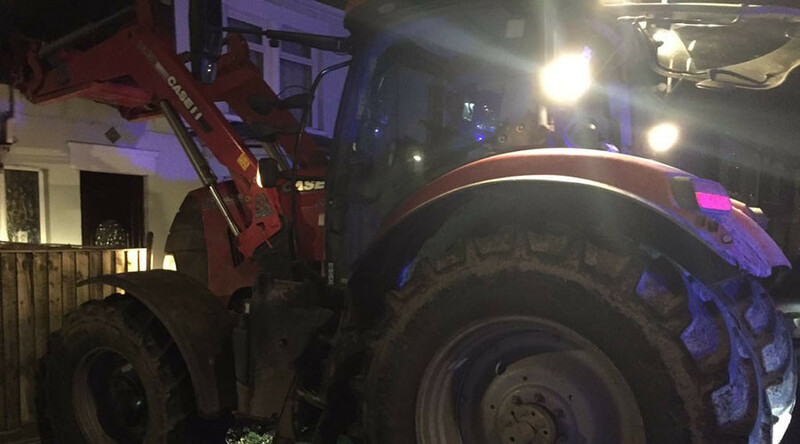 The chase that lasted for an hour and peaked at the thrilling speed of 16kph (10mph) happened last month when the 25 year-old stole the tractor from a farm after 8 pm, according to the Eastern Daily Press. The tense pursuit ended when Lovell crossed the county border from Norfolk into Cambridgeshire. In a daring escape, he jumped from the vehicle before it hit the curb and came to a thrilling stop. At one point during the chase, Lovell lowered a bucket from the tractor forcing a police car to swerve out of the way. The prosecution accused Lovell of causing £300 worth of damage to gates at the farm and £200 damage to crops. Police say Lovell did not test positive for drink or drugs and just wanted to go back to jail where he had previously served time. The judge said Lovell’s actions resulted in a waste of police resources and sentenced him to an eight-month prison sentence and a 28-month driving ban. He will also be required to take his driving test before he can get back on the roads, which they would prefer he did with a car. The BBC story about Lovell’s case incorrectly says he was sentenced to eight years in prison, as opposed to eight months, which might come as quite a shock to those who know him. Eastern Daily Press reporter Christine Cunningham confirmed eight months is the correct sentence in an email to RT.